Bella is a six-month-old Golden Retriever who was adopted by a family with six preteen children. Her guardians told me that they were near the end of their rope and actually considering rehoming her. When over excited, Bella had knocked some of the smaller children over and a bad mouthing habit was getting worse. But the most concerning behavior they described to me sounded like Possessive Aggression; a type of Resource Guarding. It can occur when the dog has possession of a item or claiming a space or person. When a dog is in a guarding state, it can look pretty scary. The dog is usually in a nose down orientation over the item with ears back, baring teeth, dilated pupils, a stiff aggressive stance. A dog in this state is capable of lunging and biting anyone who comes too close. When I met Bella in person, I was taken aback by how gentle and passive her personality seemed to be. She got a little nosy at one point and a very minor correction was almost over received by her. I would classify her as a somewhat sensitive dog. As I discuss the situation with Bella and her family I noticed that this dog received petting and attention almost constantly. Each one of the six children reached over to pet or hug her anytime she got near them. While petting is a good positive association, too much of anything can lessen its effectiveness. It’s also important to consider what a dog is doing when we pet it. If we pet a dog when is an excited, anxious or otherwise unbalanced state of mind, that is exactly what we are reinforcing. Its probably that the children had petted Bella while she was doing some behaviors the parents don’t want. But because the happened at the same time, this attention rewarded the dog for doing it. 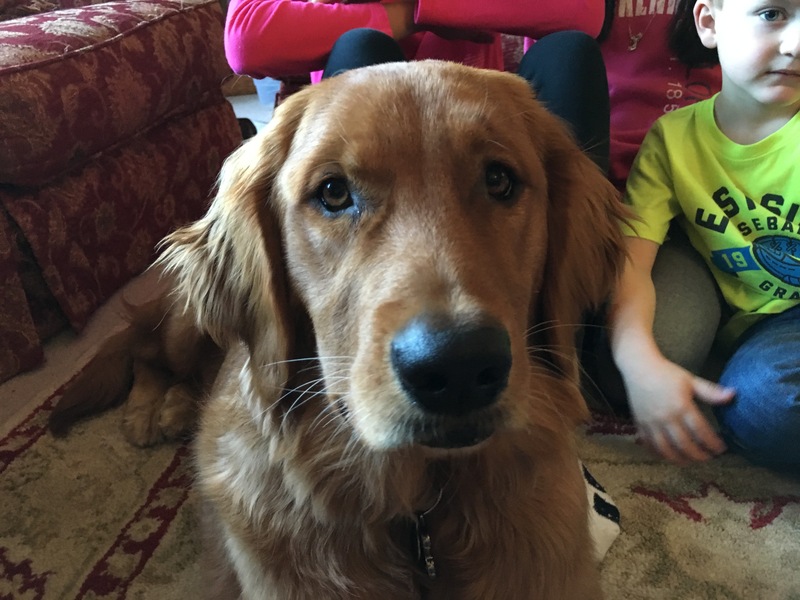 To help the members of the family start using their attention to reward the dog for doing things that they want, I went over a technique that I call petting with a purpose. Of course the flipside of raising a puppy is disagreeing with unwanted actions and behavior. Puppies are just like young children, they need a lot of guidance and supervision and correction when they go the wrong way. To help Bella’s family better communicate what they do and do not want from her, I went over a set of escalating consequences that I like to use. Another great way to stop a dog from engaging in an unwanted action or behavior is to redirect its attention. Bella’s guardians mentioned to me that her recall was spotty at best so I showed them how to use positive reinforcement and a hand motion to condition the dog to respond every time. By calling the dog to them and away from the item that it is about to become possessive over, Bella’s guardians will be able to head off a problem before it actually starts. We repeated this exercise a little bit later on in the session with the other children. The family will need to practice this recall exercise every day for the next week or so while gradually increasing the distance between the members of the family. Eventually we want Bella to be able to go up or down stairs into different rooms or come to the door from the backyard anytime anyone calls her by name. Next I showed the members of the family a leadership exercise that I developed a few years ago. The guardian ran through the exercise pretty well despite making a few mistakes. I almost wish the dog would’ve challenged him more because the exercise got completed so quickly we almost missed a few steps. The idea is to face the dog at all times and when the dog looks up at you in the face, you take a small step backwards then pause and read the dog. If the dog stays in place, you take another step backwards after a second or two. If the dog starts to come forward, you immediately make a hissing sound while stepping forward at the same time mirroring the dog. If the dog takes one step to the treat, you take one step towards the dog; provided the dog is at least 3 feet away from the treat. If the dog attempts to get any closer than that, it’s important that the human march directly at the dog until it moves at least three or more feet away from the treat. When the dog sits down, it’s important that the human take a large step backwards at the same time. Then once the dog lays down, the human can turn to their side and tap near the treat to communicate that it’s OK for the dog to get it. The next progression is that the dog will start to get up and try to take the treat when the human kneels down but before they try to tap the floor. When this is the case, the human needs to stand up immediately while making a hissing sound and then start rushing directly at the dog until it turns away and gets three or more feet away. By the time that we shot the above video, Bella had practiced the exercise several times. For some dogs with lower self-esteem or confidence, they stop coming over to take the treat even when they’ve been given permission to get it. It took a little bit of encouragement, but eventually we were able to get Bella to come and take the treat. In time Bella’s confidence will grow as she masters the exercise. Once she starts laying down within 30 seconds and coming and taking the treat within the first two or three taps, then it will be time for the guardians to start increasing the amount of time they ask the dog to wait before it is allowed to get the treat. The goal is to have everyone in the house complete the exercise with the dog waiting one minute after laying down before getting permission to get the treat. Once that’s the case, then everyone in the family will move to two minutes and continue on with one minute increases until the dog has stayed away from it for a full 10 minutes with everyone in the home separately. This exercise will take some time over the next week or two, but is going to help the dog learn to respect the little ones and see all of the humans as authority figures. To show the guardians how quickly a dog can learn to ignore, I pulled out several school projects and placed them on the floor in front of the dog. These were pieces of paper that the dog repeatedly tried to steal and chew up before my session. It will be very important that the guardians disagree with Bella the instant that she starts to show any interest towards any inappropriate object if they reconstruct this exercise. Because there are no entrapment laws for dogs, I always advise my clients try to repeat situations that the dog has failed at in the past, but to do so when the human has time to give the dog their full attention. By placing objects the dog is supposed to ignore on the floor right in front of it, and then correcting the dog with good timing any time it shows interest, we can effectively communicate to the dog that is to leave something alone. This is a much better strategy then moving the item out of the dogs reach as the dog isn’t changing its behavior under that scenario. At this point in the session I noticed that Bella had a tendency to invade the personal space of whoever she wanted to get petted by. I spent the next few minutes showing her guardians how that they can reclaim their personal space and disagree with this behavior. There’s nothing wrong with a dog coming up next to you and touching you from time to time, but because Bella had been doing this so frequently and had developed these other unwanted behaviors, I’d really like to see her guardians make an effort to reclaim their personal space for a good week or two. This will help enhance a healthy leader follower dynamic and a literal boundary of peace which equals respect. Now one of the most common reasons for puppies to get into trouble is having too much excess energy. The family’s oldest two girls had been walking Bella, but because she was pulling so strongly on the leash they were having difficulty controlling her. This resulted in much shorter walks been what the dog actually needs. I suggested that they enlist the services of Laurie, my trusted dog walker for a week to see how the dog behaves. A dog of Bella’s size and energy level needs a good 45 minute exercise, preferably earlier in the day. By having an experienced walker make this happen for a week solid, her guardians should see a notable improvement. I suggested that the family encourage the dog whenever it engaged in a game of fetch inside. The fetch is probably one of the most effective ways to burn through a dog’s saved up energy. Taking the dog out for a quick game of fetch before going for a walk, or as a maintenance action whenever the dog starts to get too excited in the house, can make the dog much easier to work with. To help the girls have even better control of the dog, I showed the guardians how to use a Martingale collar and then went over the rules that I use for a structured walk. For the near future I suggested that the guardians walk Bella in this structured way. The family has a large backyard that the dog is able to play in, so adding some structure and discipline to the daily walk is not unreasonable. This way, every time that the guardians correct and lead the dog on the walk, Bella will develop more respect for whoever is handling her. As usual, the Martingale twist made a huge difference. I had one of the older girls take the leash next so that I could coach her up through the structured walk on her own. When we returned from our walking segment, Bella’s guardians reminded me that she was often obstinate about going into or coming out of her kennel. I spent the next few minutes teaching Bella how to use the kennel on command. Bella picked up on things very quickly. In fact her guardians lamented the fact that she succumbed to my wishes so easily. They were concerned that her unruly behavior would return after I leave. This is almost always the case to varying degrees. But the difference this time is the guardians will now have the tools needed to disagree with the dog’s unwanted behaviors. its not going to be a overnight transformation as the dog likes things how they are. But by staying consistent, Bella will quickly adapt to the new leadership methods. I would say a third to half of Bella’s problem is excess energy. Bringing in a dog walker will greatly impact Bella’s behavior throughout the rest of the day. If her guardians are able to teach her how to fetch, then they can use that as a stopgap measure to burn off any excess energy that is accumulated over the course of the rest of the day. I have some clients that will take their dog out for a 10 minute fetching session 3 or four times a day. While it may seem a little cumbersome to do so, The 15 or 20 minutes you spend throwing the ball will pay big dividends on the dog’s behavior of the rest of the day (But should not be a replacement for the structured walk). Because of all the things we had done over the last few hours, I was able to give the guardians a glimpse of the behavior that they can get from their dog once it’s properly exercised. The other big factor in Bella’s rehabilitation will be the guardian’s observation of her and timing of their corrections. Throughout the session they were missing out on signals that Bella was giving or too late to take advantage of an opportunity to disagree with her before she actually got into trouble. Timing is everything when correcting a dog. It’s going to be a bit of a challenge for this family with the number of children under their roof. But if her guardians can pay close attention to the dog for the next few weeks, they should be able to curb her of most of these unwanted behaviors. Once that’s the case, the dog will no longer require such careful observation. The final factor on Bella’s road to balance will be her guardians practicing Petting with a purpose. The more that the guardians ask the dog to do something before rewarding it, the faster the dog will adopt these new desired behaviors as a way of getting the humans attention. A lot of Bella’s unwanted behaviors were no doubt an attempt to gain the attention of one of the humans in the home. Once the dog understands that the only way it can get a human’s attention is by sitting, laying down or some other trick or command, she’ll quickly give up her remaining nuisance behaviors.